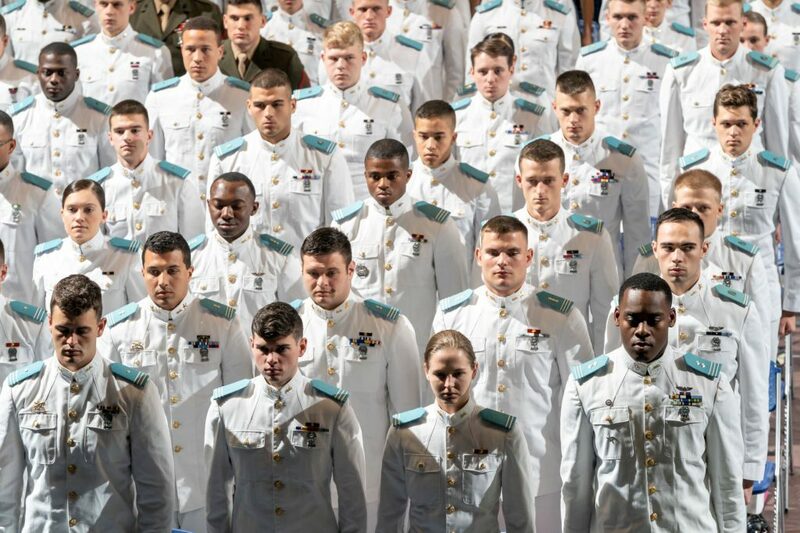 The Citadel ROTC departments provide cadets with officer training during college to allow them to begin their military careers as officers after graduation. 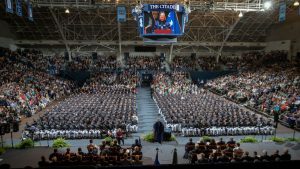 Through the departments, which include Air Force ROTC, Army ROTC, Marines ROTC and Navy ROTC, The Citadel is one of the nation’s proven producers of top military leaders. Presented a junior cadet in recognition of outstanding achievement in leadership and academic standing in the Air Force ROTC. Presented to Army, Marine, Navy and Air Force cadets who have demonstrated military excellence. Presented to Army, Marine, Navy and Air Force cadets who have demonstrated scholastic excellence. Presented to ROTC cadets for diligence, discharge of duty and willingness to serve God and country. Recognizes ROTC students who have demonstrated good moral character, academic excellence and potential to serve as officers in the United States Armed Forces. Presented annually to the cadet who epitomizes the Army values of loyalty, duty, respect, selfless service, honor, integrity and personal courage. Presented to a cadet who has demonstrated a strong interest in and acumen regarding the study of military history. 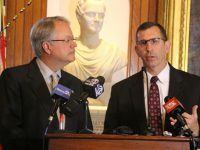 The award is a joint project of the Association of the U.S. Army, in conjunction with the US Army Center of Military History. Presented to ROTC cadets who have displayed the ability to solve problems outside the box by using innovative thinking and carrying it through to execution. Presented to one outstanding cadet from each ROTC unit who demonstrates the qualities of dependability and good character, leadership ability and a fundamental and patriotic understanding of the importance of ROTC training. 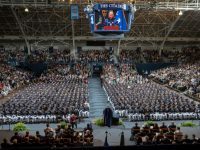 Honors one graduating midshipman at each NROTC Unit and midshipmen at the U.S. 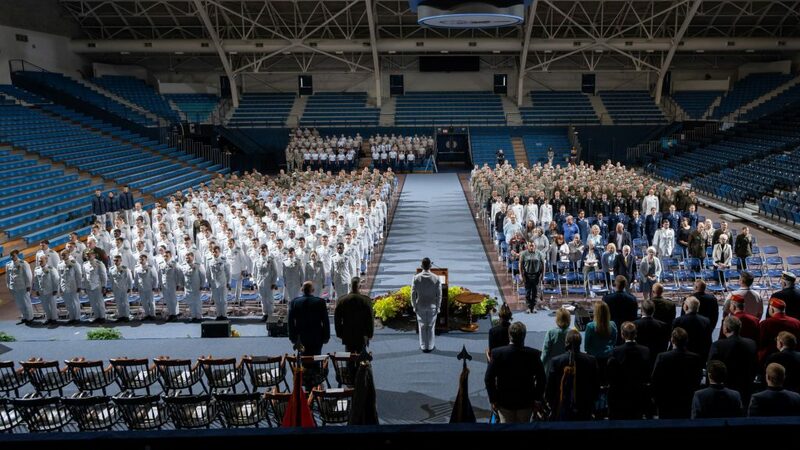 Naval Academy who demonstrate the highest standards of leadership, academic and military performance. Recognizes outstanding upperclassmen who have demonstrated the qualities of leadership and high scholastic average, and who are highly active in student affairs. 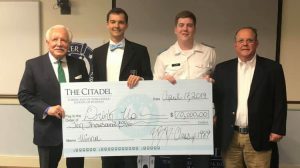 The Department of the Army provides this award annually to the outstanding ROTC cadet in each year of military science at The Citadel that is in the top 25 percent of their ROTC class and academic class. Presented to a cadet who successfully graduates from the Leader Development and Assessment Course, is compliant with the Army ROTC contract and exhibits exceptional leadership ability and potential. The General Westmoreland Award is presented to an airborne qualified cadet at The Citadel by The 82nd Airborne Division, Lowcountry Airborne Chapter. 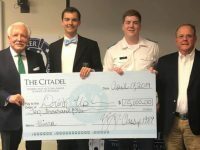 Presented to a Marine option midshipman in recognition of high endeavor and superior accomplishment during four years of study at The Citadel as a Marine option student. Presented to outstanding Marine and Navy seniors that have excelled in the areas of leadership, academics and military performance. 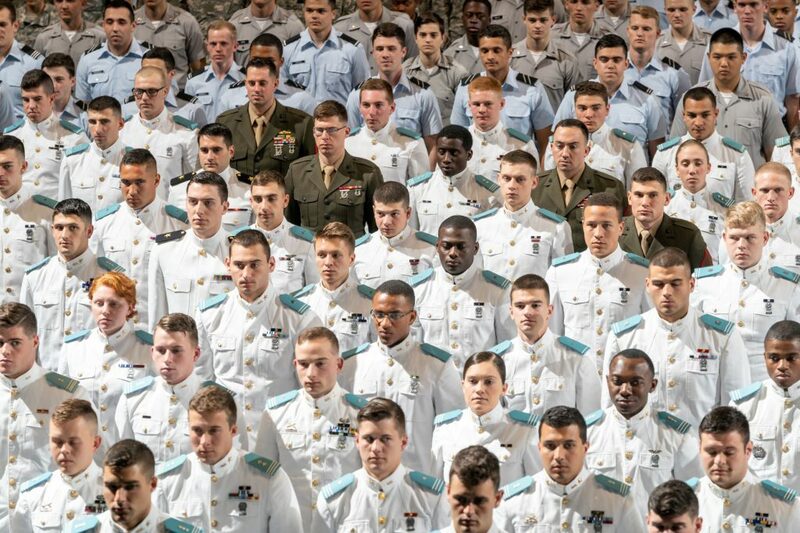 Presented to outstanding cadets or midshipmen in their next-to-last year in the program who has demonstrated exceptional potential for military leadership. 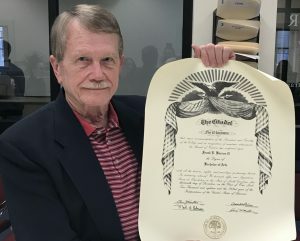 Presented to one member in the 2nd, 3rd and 4th class from each branch of service for their diligence in demonstrating military excellence and outstanding accomplishments during the year. Recognizes a senior cadet who demonstrates outstanding leadership qualities, academic achievement, and aptitude for military service. Presented to a cadet who has demonstrated exceptional leadership qualities. Recognizes cadets in each ROTC department who have a potential for outstanding leadership and have encouraged and demonstrated the ideals of Americanism by deed and conduct. Presented to the top Navy ROTC graduate volunteering for the Submarine Force. Presented to the top academic performers of the personnel within the Enlisted Commissioning Programs of the Navy ROTC department. Presented to a female Army cadet who showcases scholastic excellence and is outstanding in her class. 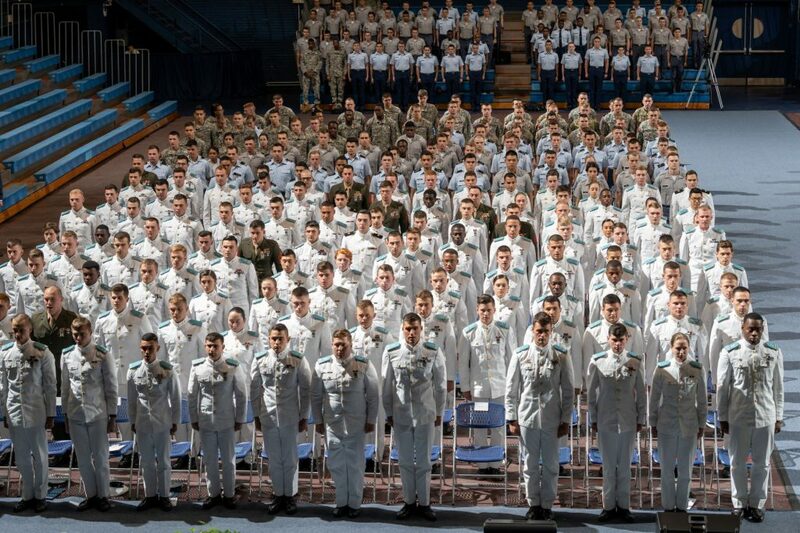 Presented to cadets who have demonstrated outstanding competence in the arts and sciences of national defense. Presented to cadets who have significantly demonstrated and encouraged the ideals of Americanism by both deed and conduct. Presented to cadets in the 3rd class who have done the most to demonstrate and encourage the ideals of Americanism by both deed and conduct. Presented to the outstanding Army, Marine, Navy, and Air Force cadets based on military excellence and scholarship in their ROTC studies and activities. Recognizes outstanding engineering students of the Military Reserve Officers Training Corps. Presented to a standout freshman or sophomore cadet who has shown scholastic excellence and military proficiency in keeping with the ideals of U.S. Special Forces. Presented to outstanding cadets who have made significant contributions to demonstrate and encourage patriotism through participation in activities on campus or in the community. Presented to students in each ROTC department that best display the traits and characteristics that embody the spirit of service to others. Presented annually to seniors or juniors in each ROTC department who has achieved an outstanding academic record.